What will it take to settle Mars? Whichever planet you live on, life is too sad and mysterious and joyful to fit onto the page, but that won't stop me trying. Come on in and enjoy the view. (If you don't have a Google account, select "Comment As" and select "Anonymous") and be sure to read these new Mars short stories... New World Rising -click, then scroll down. I've now published a short new section of the New World Rising story. In the background I'm toiling away on the next part of the main storyline, but for some context we are skipping back millions of kilometres to Earth, and to a U.N. conference centre, where we eavesdrop on a couple of conversations. Nowal No'man Saiid, the CEO and majority shareholder of Sabir Space Industries, is acting as a delegate at the negotiations to update and re-write what is known as the Outer Space Treaty, or more formally as 'Treaty on Principles Governing the Activities of States in the Exploration and Use of Outer Space, including the Moon and Other Celestial Bodies'. You can read the actual treaty, which was developed through the 1960s, on this U.N. website. The initial page is a summary and introduction, but the first link in the text should give you the complete text. It's not light reading! The legalities of what is and isn't allowed above the Earth's atmosphere is a real concern. There is even an International Institute of Space Law. In this short piece of writing, I imagined what it would be like when this treaty is finally updated to align with the present realities of space exploration. Here it is; it will be followed fairly soon by a much larger amount of writing, following the SSI team on the surface of Mars. So far, you can access these pieces via 'History Makers'. I watched the Falcon Heavy launch yesterday with bated breath, half-expecting an accident on launch of the type they jokingly call a 'rapid unscheduled disassembly event'. But it went almost like clockwork. If you missed it and want to watch this historic moment, here's a link. If you watched the whole thing, did you see the shots from a camera mounted just outside the viewing area of SpaceX's Mission Control room? See the large crowd of excitable SpaceX fans? Well I'm pretty sure that most of them were actually off-duty SpaceX employees. The Mission Control and most of the fabrication facilities (as far as I know, which isn't far) are in Hawthorne, California. Can you imagine having worked your knuckles off for months, labouring long hours in a workshop or lab, testing hundreds of components, striving to measure up to Elon Musk's almost fanatical standards... and then, finally, watching on a screen as your handiwork roared off the pad and into the sky? No wonder they were cheering so loudly. I imagine they were incredibly relieved that the huge new rocket didn't explode or fail in some other way. I imagine they went home feeling like they had contributed something meaningful to the world, that they were making history. That's a great way to live - a life of meaning, getting involved in something larger and more significant than yourself. But you don't have to work for SpaceX to get that buzz - the opportunities are all around us. Here are the short pieces following the launch of SSI's first Mars mission. The point of view swaps between the four characters involved. Briefly, here's part of the new short story, again from Marco's point of view. And it's only a few weeks until launch. Meanwhile, you could go over to the SpaceX site and see how quickly fact is catching up with fiction. 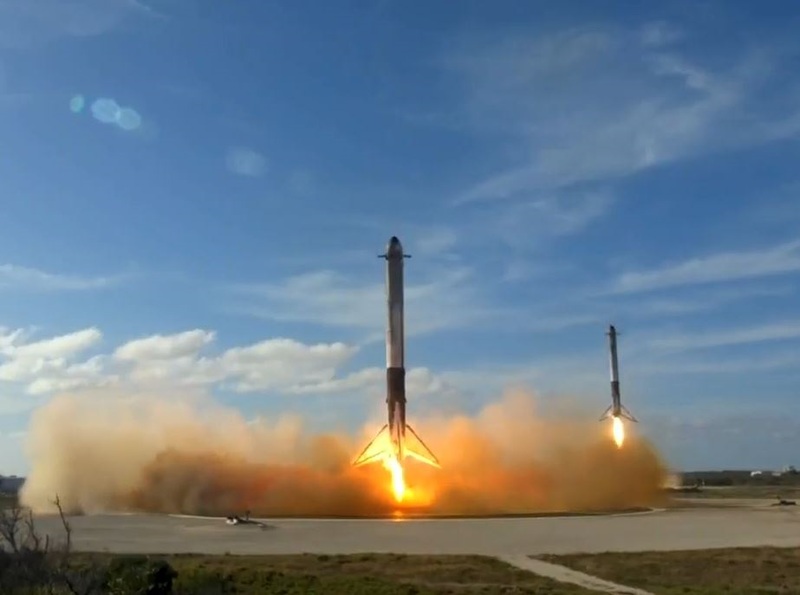 The intrepid rocket engineers are hoping to carry out the first test launch of a Falcon Heavy rocket, along with all the complications that come with strapping three Falcon 9 cores together. That is a lot of thrust happening. Will the FH make it to orbit? Will the 3 cores fly back to Earth to be reused? And what was the idea of launching a red Tesla Roadster into deep space? Here's a well-produced website that explores one model of settling Mars, with videos and slick graphics. Edit... since first posting this I've tried out some of the simulations on this site. Be prepared for a difficult ride: the control doesn't seem to work well, making it hard to complete some tasks. Also don't expect total realism... they are using an image of a SpaceX Falcon 9 or Grasshopper rocket for the Mars landing simulation, for example. But oh well, it's free. No complaints! Annika and Marco are new to the number one SSI Mars crew. Here are two short pieces introducing them. As Marco remarks, "If – no, when – a crisis hits, what keeps us calm and pulling together?" What will it take for these four very different people to become a close-knit team who can thrive together on a distant planet? There's now a short story called 'Ice And Fire' describing the first humans landing on Mars. ... and yes, any '70s music fans out there, I am aware that I've ripped off the title from an ELO song. I used to own a copy of the album. But I'm pretty sure Jeff Lynne won't notice. Originally an engineering graduate from the UK, John Peace worked in community development in the Middle East for some years. He settled with his Canadian wife and their two sons in Ontario, where they enjoy the great outdoors.